They say, “well planned is half done” and rightly so. If you take any exam as a project and plan well ahead in time on your goals and strategy, the chances of success dramatically increase. Until you have the right aim and focused approach, all the efforts in random directions lead to an eternal state of chaos and confusion. Common Admission Test is one of the coveted exams of the country and every year lakhs of candidates appear to secure admission to best business schools in the country – Indian Institutes of Management. Preparing for this exam is a long journey and candidates prepare for months or years before even appearing for the first time. While one may be tempted to join coaching classes, attempt mock papers or practice puzzles, it is imperative to take a moment to lay the ground work. 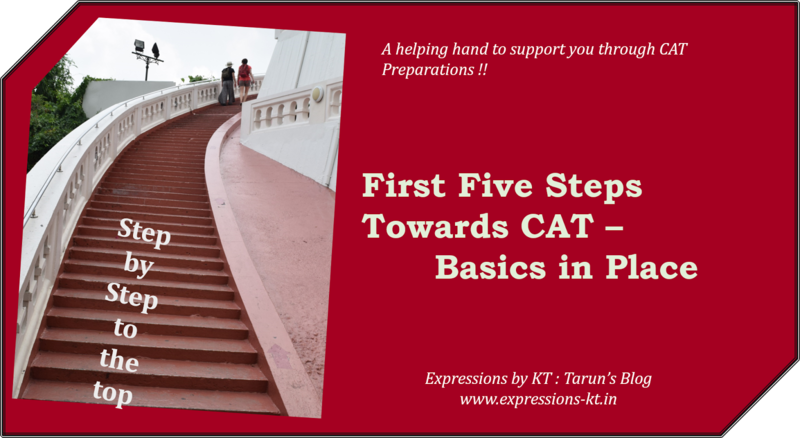 So here are, what I recommend, the first five steps that one should take before embarking on this journey of preparing for the CAT, a journey you would cherish for life, no matter how long or cumbersome it is for you. Everyone has their own reason to pursue an MBA and specifically from an IIM. Some have dreamt of being managers from childhood, some want to experience the number crunching on excel sheets, and some are looking to change their job profile while others are just following the herd. The first thing to consider before beginning preparations is your reason for aiming for CAT. Now, why would one want to waste time at this stage thing about abstracts like this? The reason is that it would help you decide what is important to you and how would you like to tackle your exam preparations. Everyone has their set of conflicting priorities. If you are a student, you would have to manage studies with you preparation while if you working, you would have to keep you bosses appeased while taking time out for studies. Then there would be some who would have responsibilities of families, social events and other things of life which would try to take away time from the limited hours until the exam. Having your priorities defined in advance would help you a lot while managing these conflicts and ensuring that you invest enough in what is important to you. Before you begin a journey, knowing your destination and understating the route is a key pre-requisite. This is applicable for your CAT preparations too. Candidates should sit down and understand what exactly they are getting into. This is an important career decision that you have taken and you should be aware of its implications. I would recommend that everyone understands what this examination is about, and what it needs to crack it. Further, it is equally important to know about the IIMs and life post MBA. I am sure you made your mind to appear for CAT after all of the research but just wanted to point out its importance before actual preparations. It is best if you talk to seniors who have been through the path and have either chosen to stay on course or changed their path mid-ways. Both would have a very different perspective to share and would either help you strengthen your resolve to appear for the exam or force you to think twice. None of this would be wrong at this stage. You are making an important decision for your life which would be there with you for next decade at the least and hence this is a good point to make course corrections if any. Once the mind is made up and resolve strengthened, it is time to dig deeper into your preparation strategy. I have heard many students ask – how to begin preparations from scratch? My first query to them is – Define scratch or ground zero or zilch or start. No one is born yesterday when they start their CAT preparations and hence there is no absolute zero level for candidates. Every candidate has picked some skills, some strengths, and some specialization by the time they are at a stage thinking about this exam. If you are an engineer, stereotyping tells me you would be good at Quants. If you are an English language student, engineers envy you for your lead in verbal. Or if you are a lawyer or chartered accountant, your logics are fear for others. So first of all set what you starting point is. The best way to do this is to pick up a latest available copy of CAT syllabus. This is what you need to cover up in next few months or year of your preparation. Read it thoroughly and identify which topics feel easy to you, which you have heard about and which sound gibberish fiction. This is how you define your strengths and areas of opportunities for the CAT examination’s perspective. While you may need only practice in some areas, you may need to go for a high school level book for others areas. 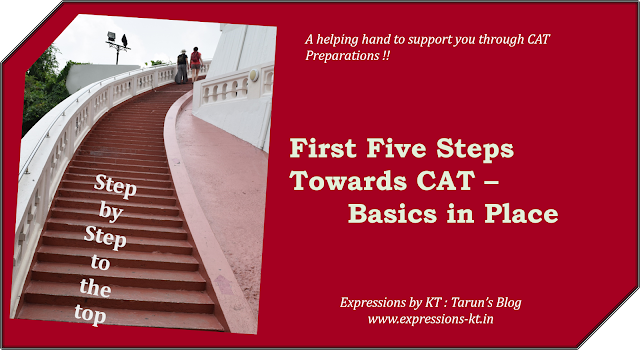 Identifying which of the CAT syllabus component goes in which bucket is the foundation of your preparations. Don’t worry, you would have your chance to calibrate this decision throughout the preparations but no harm in being careful with the first attempt itself. You have your priorities identified and have prioritized conflicting commitments by now. Assess all your commitments and identify the time you would be able to take out for your CAT preparation. Yeah you read it right – take out time for preparation. Now, how come the preparations for this important exam take a second place to anything? It could and in most cases it does. You may have to spend time for your under graduation studies – you need to pass college at the least, or you are an employee and manage an average grade to secure your next pay check. So estimate the time you can devote to your preparation. Next use your buckets of strengths and improvement areas to ascertain where to devote more time. Based on this estimate and time available until the exam prepare a roadmap for your preparations. Develop a week wise schedule of progress towards the goal and define broad phases and milestones. Phases could look like the revision of theory, topic wise practice, mock paper intensive preparation, revision of topics identified by mocks, final stages of revision etc. Everyone would have their own set of phases and milestones and pace of achieving those milestones. Also based on time available to you, evaluate the potential modes of preparation – coaching classes, self-study, group-study, test series etc. Each of these modes demands a varied level of time commitment and provide different level of support. Choose one which best suits your requirements. Next step to your preparation is bringing everything you need in place. That would include identifying the right books, coaching classes, test series and reference material. Again I would suggest to get in touch with seniors who have gone through the path and are most closely aligned to your situation. If you can, for college students, check with your alumni. For those employed, socialize with those who cleared CAT and have similar backgrounds. This helps by getting to you advice most customized to your needs. While choosing books, try and obtain the latest versions of the most popular books. There is a reason they are popular. Also, make best possible attempt to choose a coaching class nearer to you as time you travel is the time you waste. Coaching does not provide a ticket to success but only helps you keep track of the course. Most national chains of coaching provide more or less similar experience and hence I recommend not running for a particular brand. Also, make attempts to ensure that you would have constant supply of questions and mock test papers throughout your preparation. When you get to solving 2-3 mocks per week, supply is all you need. I know one may wonder what value is derived of delving into seemingly black-holes and why waste crucial time in thinking the unthinkable. I agree that the thought is logical and it is difficult to drive concrete value out of it. Also, probably one would have anyway done this process subconsciously. However, these are critical for effective preparation and would definitely help you take informed decisions during each stage of your preparations. There would be challenges during the entire process and having basics done in advance would help tackle those challenges effectively. Further, most of these are not as time consuming as they seem and most of the five steps can be completed in over a couple of days. And consider this as an investment into your future rather than time wasted in futility. Again, it may work or not, as there is no one key to success and all these are to enhance the chances of seeing you behind the walls of the hallowed halls of learning. Wish you have a solid start to your preparations. It is a long journey so stay committed and stay focused. Have enough social time as that would help you keep going towards your goal. In the meantime, if you have any questions, queries, and doubts use the comments section below and I promise to respond within a day. Or if you prefer, drop in a mail at kt@expressions-kt.in to reach out to me privately. There are a lot more resources to support your CAT preparations on the link below. Happy Studying! !